Achtung Cthulhu is a name sure to catch a lot of your attentions. It's a new RPG world that's coming out later this year. I know I'm intrigued. Achtung! 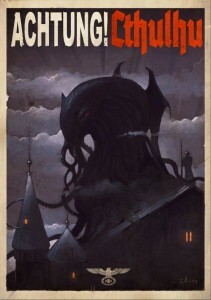 Cthulhu brings you a two-fisted wartime roleplaying game setting packed full of fiendish Nazi scientists, terrifying ancient mysteries, legendary German war machines, desperate partisans, gun-toting paratroopers, determined investigators, and enough writhing tentacles to pack ten Reichstags. Discover the secret history of World War Two - stories of the amazing heroism which struggled to overthrow a nightmare alliance of science and the occult, of frightening inhuman conspiracies from the depths of time, and the unbelievable war machines which were the product of Nazi scientific genius - and how close we all came to a slithering end! Featuring stunning art by illustrator Dim Martin and more artists to be announced, Achtung! Cthulhu will be packed full of evocative and inspirational scenes. The product line includes several major campaigns; Achtung! Cthulhu - The Mountains of Madness sees a return to Lovecraft's infamous Antarctic world and is set during the opening shots of WW2. A hastily assembled Allied expedition must pursue the Nazi war machine deep into the Antartic to discover the secrets of a lost continent and confront a terrifying reality. Imminent episodic Achtung! Cthulhu releases will set the stage for the campaigns and main setting arriving later this year. Written for several of your favourite RPG systems, Achtung! Cthulhu will thrust your characters in to the midst of a dark and desperate struggle, as Cthulhu's minions take advantage of the chaos wrought by the Third Reich to topple civilization! The massive world-spanning Achtung! Cthulhu setting features occult conspiracies, terrifying Nazi war machines, and an ancient evil so powerful that it threatens to tear the world apart! Achtung! Cthulhu will also be available for Expeditions, a brand new standalone roleplaying system designed to introduce new friends to roleplaying. Expeditions - Achtung! Cthulhu will feature complete rules for exciting roleplaying adventures in World War 2, as well as equipping company-sized expeditions to confront the horrors unleashed! Achtung! Cthulhu & Expeditions are both being developed by new games imprint Modiphius founded by the ENNIE Award nominated Starblazer Adventures & Legends of Anglerre writer Chris Birch. Modiphius will be working with some familiar names in publishing to bring their digital releases to physical print, promoting great artists & writers and giving gamers some amazing worlds to play in!